This week, I booted up Windjammers for the first time on a PlayStation 4. A Neo Geo cult classic, I never had the chance to play it when I was young. I suspect many picking it up now didn’t either. As Neo Geo games find new life on platforms like the Nintendo Switch and the PlayStation 4, it’s interesting to go back to them. My introduction to Windjammers wasn’t through a review or press release, but a video of several dudes playing it on Giant Bomb. It doesn’t have the same allure as other games on the system, but it’s something of a cult classic, and the PS4 release was an opportunity to spend some time with it on its own. The easiest way to describe Windjammers is as a more active version of Pong. Two competitors stand on opposite sides of a court and fling a disc back and forth, trying to sink it in the other’s net. It’s simple, but it makes for a good casual multiplayer game. Buttons add a level of complexity by letting you lob instead of throw, or catch a disc in order to toss it up for a special move. But Windjammers is easy enough to understand that anyone can get a handle on it in less than a single round. Everyone I handed a controller to was able to understand it in an instant. Windjammers on PS4 also goes to great lengths to stay faithful to its original format. The default is a cropped standard-definition playing field, filling on both sides with character art. Visually, it looks like a crisper version of the original, and there are options to add aesthetic elements like scan lines for a little hit of nostalgia. It sounds like a Neo-Geo game, looks like a Neo-Geo game, even plays like one. For someone who hasn’t played more than a few one-off casual rounds of Windjammers, these are effective tools for evoking warm reminiscence. I don’t have specific memories tied to Windjammers, but it reminds me of things that I held dear growing up. It’s like hearing some generic rock-sub-pop summer tune on the radio. The song is new, but the feeling stirs something familiar. Windjammers is far from generic pop, though. On its own terms, it’s still a stellar game. It’s easy enough to see why it garnered an unironic following years later. The back-and-forth is electric, feeling like the best mix of fighting games and sports games. It’s a competitive game at heart, reflected by the basic offerings in the menu, plunging you into either local or online play or a straightforward arcade mode for challenging the CPU. 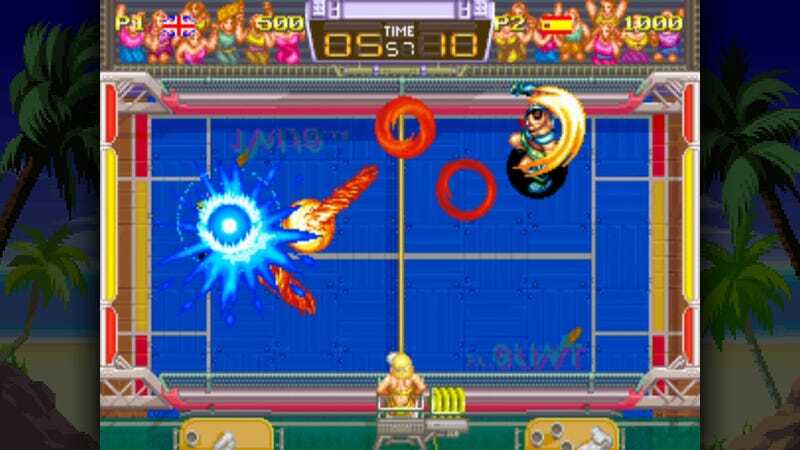 As a competitive experience, Windjammers is still fun enough to spend hours poring over, mastering your play, honing that muscle memory and finesse to play at top speed. Online netcode isn’t always stellar, and if you’re not the kind of person who gets into climbing ladders and competing against better players, there’s little else to do here. But Windjammers is something I know I can get anyone to pick up and play for a few rounds. It has a few buttons and basic controls, but it still allows for high-level finesse and strategy. While it may seem like a nostalgia grab, the gameplay is still fresh for someone coming to it for the first time. Even without having grown up with Windjammers, each time I boot up it up feels like a return to my youth. Years later, it’s still a fantastic competitive experience, a cult classic for good reason.